Anyone who happens to glance up at the sky a few hours before midnight on Sept. 27 may be startled to see a huge red moon. On that date, for the first time in more than 30 years, a total lunar eclipse will occur during a “supermoon” — when the moon is closest to the Earth. When the moon is farthest away from the Earth, it is known as apogee. When it is closest it is known as perigee. On Sept. 27, there will be a perigee full moon, the closest full moon of the year. “The difference in size between the moon at closest approach and its size at the furthest point in its orbit is very small and is not obvious to most people,” Peter Garnavich, a professor of astrophysics at the University of Notre Dame, said. “The truly spectacular event is the total lunar eclipse, which will turn the Moon a deep red. The supermoon eclipse will be visible throughout North and South America on the night of Sept. 27 and in Europe and Africa in the early morning hours of Sept. 28. “Mid-total eclipse is due to happen at 10:47 p.m. in South Bend, but totality starts just after 10 p.m. and lasts until about 11:30 p.m.,” Garnavich said. “A bite out of the Moon (partial phases) should be noticeable starting just after 9 p.m. and the obvious effects will last until about 12:30 a.m. Unlike a solar eclipse, which is dangerous to look at with the naked eye, experts say it’s perfectly safe to watch a lunar eclipse. 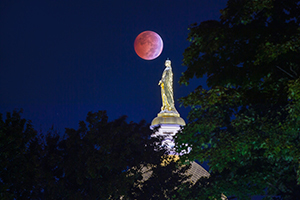 Originally published by William G. Gilroy at news.nd.edu on September 23, 2015.